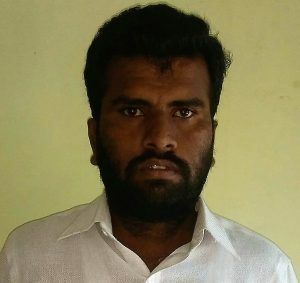 28 year old Yogesh Suryavanshi belongs to Nasik district, Maharashtra. He started to lose his vision at the age of 15 due to night blindness and at present he is 90% visually impaired. Yogesh was pursuing Class 10th when he started facing problems due to his vision impairment. As a result he failed his Xth. He was unaware of any facilities for persons with blindness. He referred to various doctors and ophthalmologists but no one provided him with any proper guidance on life after blindness. Since Yogesh had no information about schools for the blind, braille script or scribe facilities for visually impaired students, he quit his studies abruptly and 13 years of his life passed by without an education. In this time that he stayed home, he didn’t want to remain idle so he assisted his family members in farming activities. Recently in 2018, Yogesh learnt about blind school for learning braille from his village sarpanch. He joined the school in Malegaon but was dependent on his father to take him every day. Looking for assistance online, Yogesh’s brother chanced upon Eyeway toll free number and they decided to call the Helpdesk. The Eyeway counselor informed him about various provisions, technology, education and employment opportunities available to persons with blindness. Yogesh was curious as to how could he navigate to his school alone, for which the counselor told him about smartphone apps like Lazarillo GPS for the blind. The counselor also emphasized on the need for Yogesh to undergo a proper course of rehabilitation so he can empower himself to study or work as per his choice. He was informed about a rehabilitation training of 3.5 months at NAB (Mumbai) for mobility, English and basic computer skills including how to use a smartphone. Eyeway counsellor also apprised Yogesh of the option of completing his education and enrolling in Class 10 through National Institute of Open Schooling (NIOS). But at 28, finding employment and gaining financial independence was a higher priority for Yogesh. So our counselor recommended enrolling at the Tata Agricultural and Rural Training Centre for the Blind in Gujarat which offers training in poultry, horticulture, animal husbandry etc. Since Yogesh was familiar with such farming activities he chose to join the TATA Center. Here he would also learn mobility, braille and home science in addition to the agricultural training. Yogesh has found new hope in life. He is eager to finish training, pursue education through distance learning so he can support himself and his family.